CAPE GIRARDEAU, Mo. 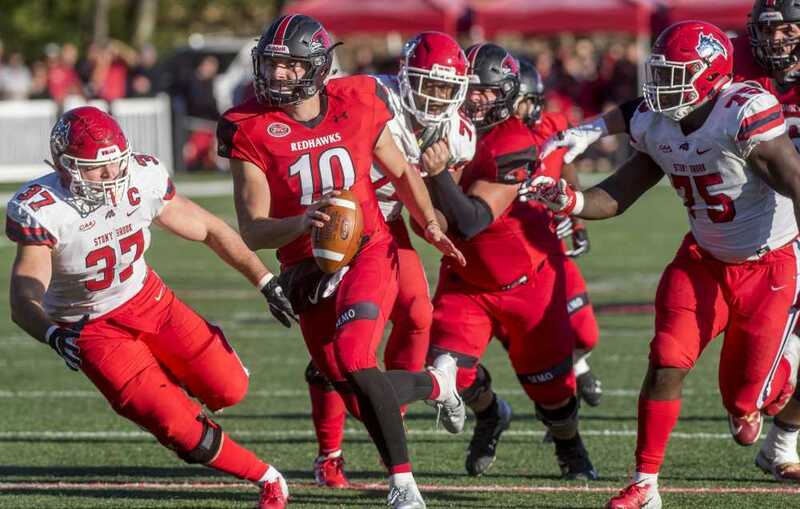 – Southeast Missouri (9-3) kept its historic season alive when it erased a 14-point deficit by scoring 28 third-quarter points en route to a 28-14 victory over Stony Brook (7-5) Saturday afternoon. 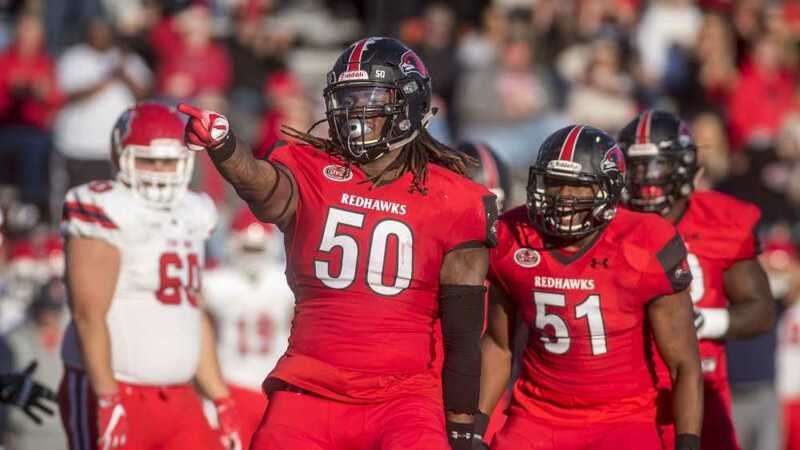 SEMO trailed, 14-0, at halftime after struggling against a tough Stony Brook defense in the first half. The Redhawks spent less than ten minutes of the first half on offense, managing a grand total of 103 yards on offense. But the Redhawk defense, which leads the nation with a +27 turnover margin, then took the game over in the second half. Justin Swift intercepted a Joe Carbone pass that was tipped by Clarence Thornton on the Seawolves opening drive of the second half. The turnover gave the Redhawks the ball at Stony Brook’s 24-yard line. Four plays later, QB Daniel Santacaterina scored on a 16-yard run to make it a 14-7 game. On Stony Brook’s next possession, Carbone was intercepted again, this time by Taj Jenkins at the Seawolves 38-yard line. Santacaterina, after rushing for 29 yards on three carries, threw a 5-yard touchdown pass to Kristian Wilkerson which tied things up at 14-14 at the 10:06 mark. Following a Stony Brook punt, SEMO took over on downs in Seawolves territory again at the 40-yard line. Three penalties, including an offsides, pass interference and personal foul helped get the Redhawks a first-and-Goal at the Stony Brook 9 before Santacaterina hooked up with Jerrick Orr on a 9-yard touchdown pass to give SEMO its first lead. A 39-yard punt by Jake Reynolds hit Donavin Washington and Demarcus Rogers recovered the fumble at the Seawolves 38-yard line, again giving the Redhawks excellent field position. On the next play, Santacaterina tossed a 38-yard touchdown pass to Kristian Wilkerson with 3:42 on the clock. SEMO’s 28 points tied for second-most in the third quarter during its NCAA Division I era as the Redhawks beat their second ranked opponent this season and eighth in program history. The Redhawks will visit No. 2 Weber State in the second round of the FCS Playoffs on December 1st.